June 21st is World Music Day, also known as Fête de la Musique in France, where it all started. This week I bring you a whole variety of music genres. I do this by means of a Putumayo world collection vis-à-vis an artwork that is representative of that particular music genre. “Take a Caribbean cruise with Putumayo to Martinique, Guadeloupe, Barbados, Jamaica, Montserrat and Haiti, and experience the infectious, hip-shaking rhythms of zouk, soca, compas and reggae. Join local legends and international stars, Arrow, Tabou Combo, Krosfyah, Coalishun, Bunny Wailer, Ralph Thamar, Kali, Mystic Revealers, Eric Virgal, Bago and Patsy Geremy as they show us how to have fun in the sun. “The genre of Caribbean Music encompasses a diverse variety of musical styles and traditions from islands that are located in the Caribbean Sea. The styles range anywhere from traditional folk genres such as the Puerto Rican aguinaldo and Jamaican mento to more contemporary music such as salsa and reggae. History: “The history of Caribbean music begins with the Native Americans, the first inhabitants of the islands. Traditional tribal music which featured percussion instruments developed but perished along with most of the Native Americans in the 1600s. Subsequent Caribbean music emerged as a result of new relationships between African slaves and European settlers. The settler communities, as opposed to the plantation towns, attracted large numbers of very different people and harbored a very lively music culture. Distinctive Styles: “Most Caribbean styles may be grouped into the categories of folk, classical, or commercially popular music. Folk styles were derived primarily from African music and tend to be dominated by percussion instruments as well as call and response vocals. Included in this category are the traditional Cuban rumba, the Puerto Rican bomba as well as music associated with Afro-Caribbean religions (such as Haitian, voodoo, and Cuban Santeria). A few styles, however, reflect a more European influence. The Puerto Rican jiharo music and Cuban punto are two key examples. Local forms of classical music were created in the nineteenth century in Cuba and Puerto Rico as formally trained composers began to infiltrate the area. The most prominent styles in this category are the Cuban contradaza and the habon (a lighter and more rhythmic but also Cuban style). 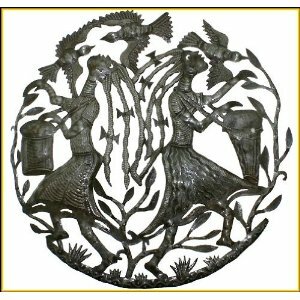 Haiti Cheri presents a beautiful selection of Haitian steel drum metal sculpture wall hangings. Each of Haiti Cheri’s outstanding metal designs have been hand cut from a flattened 55 gallon steel oil drum. The fine details within the metal art designs are worked with a hammer and chisel by a very talented Haitian metal artist. This is not a machine or laser cut metal art piece, but 100% hand work. Steel drums were invented on the island of Trinidad around the time of W.W.II. One can trace the roots of these instruments back to the African slaves who were placed on the island by Spanish and French plantation owners as early as the 16th century. The constant struggle against the “elite” upper class brought many hardships and frustrations to the African slaves; most of them had been separated from their families and lost their native languages. Music was their only link back to Africa. The elite classes were notorious for setting specific rules and hours for African drumming. They were fearful the drums would incite the slaves to rebellion and that perhaps they were sending rhythmic messages. Over the centuries, as the upper classes would ban the lower classes’ instruments , the lower classes would simply invent a new performance instrument. Rhythmic elements of African drumming can be heard throughout the evolution of steel drums and is used in the percussion sections (engine rooms) of the steel bands today. The next important step in the evolution of the steel drum was metal beating bands of the early 1930’s as a gradual replacement for the banned tamboo bamboo. These bands consisted of players using all metallic instruments (i.e. tin pans, biscuit drums, dustbins, ect.) and were sometimes referred to as “iron bands” or “pan bands”. It was soon discovered that these non pitched metal instruments changed pitch after they had been beaten for a while. The very first pitched steel drums were made from smaller metal containers and were convex in shape. The performer would carry the smaller metal drum with one hand and beat the metal with the other. These instruments were crude; they were still in their experimental stages and had no intentional pitches. In the 1940’s and 1950’s pan innovators experimented with the stylings or note patterns, and improved upon the tuning. Today the drum is constructed from the bottom of a 55 gallon barrel, sunk down in a concave fashion, and tuned with precision. 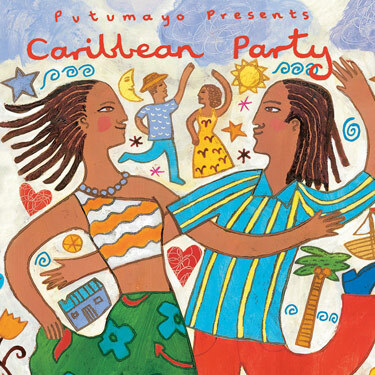 I have chosen to feature Putumayo’s “Caribbean Party” music collection alongside a steel drum artwork from Haiti because I want to highlight the Caribbean survival spirit and ingenuity. The African slaves who were brought to the islands to work on the colonial plantations went through a lot of suffering, they had to employ some amount of ingenuity to survive their harsh living conditions. Most of them had been separated from their families and lost their native languages. It was the music, especially the ‘drumming’, that became their means to communicate, connect, liberate, heal and eventually celebrate (when emancipation was finally granted!) Indeed, the steel drum is a great symbol of the triumph of the human spirit and of music as a universal language! 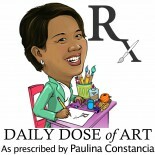 This entry was posted on June 22, 2012 by Paulina Constancia in Uncategorized.